Added by Bill Bowman on August 25, 2018. 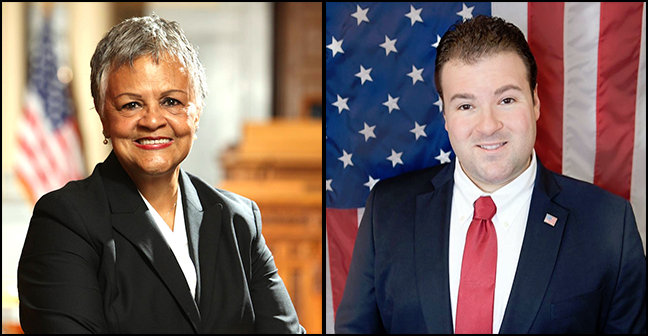 U.S. Rep. Bonnie Watson Coleman is being challenged for the seat by township resident Daryl Kipnis. The two major candidates for the 12th U.S. Congressional District seat sparred recently over tweets one made criticizing Pres. Donald Trump and the Republican-led Congress. Kipnis did not specify the “proven corruption” in which Watson Coleman has engaged. “Sometimes, the only place you should look to weed out graft and corruption, is in your own mirror,” Kipnis wrote in the release. “It’s hard to take such blustering seriously from someone who cannot keep her own house in order. We need to have someone in Washington, D.C. that is serious about the business of the people in this district and is working daily to see that their best interests are being heard in our nation’s capital. That is exactly what I intend on doing when I go to congress and what I will continue to do for as long as I serve the citizens of New Jersey’s 12th District. Watson Coleman’s camp hit back. “My opponent accuses the president of ‘comforting Nazis’, yet neither she nor Gov. Phil Murphy, her good friend and former U.S. Ambassador to Germany, can explain why Jakiw Palij, the last remaining Nazi war criminal residing in the United States, was permitted to live in the comfort of his home in Queens for years, until the proactive Trump administration finally deported him this week,” Kipnis wrote. Palij was deported to Germany after living in the United States since 1949, becoming a citizen in 1957. According to published reports, he had remained in the country since his citizenship was revoked in 20o3 because none of the European countries to which he could have been deported would accept him. Murphy was the U.S. Ambassador to Germany from 2009 to 2013. “The fact that our opponent has aligned himself with Dr. Sebastian Gorka, a man deemed so extreme he was even banned from the Trump White House, should be a great indicator for everyone involved of the depths he is willing to sink between now and November,” Darcy said. The post was still on the Facebook page as of Aug. 25. 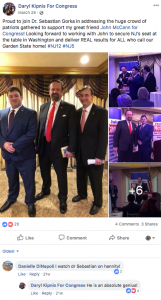 Gorka, a former Trump advisor who was reportedly forced out of his position in August 2017, has been linked to a Hungarian organization – Vitézi Rend – that has been called a Nazi-allied group. A report in The Forward charged that Gorka is a “sworn member” of the group whose founder was a known racialist and anti-Semite, while another report said that he “expressed support in the past for a Hungarian far-right paramilitary group with overt anti-Semitic tendencies.” A story in The Times of Israel reported, with photos, that Gorka wore the uniform and medals of the Vitézi Rend at Trump’s inauguration. Gorka, who has denied the charges against the organization, has said he wore the uniform and medals as an homage to his father.